Drowsy Driving Motorcycle Crashes Injuries | Hupy and Abraham, S.C. It is hard to know when another driver is drowsy or when fatigue has caused a crash. According to the National Sleep Foundation, the majority of adult drivers in the United States have driven while they were tired. The government estimates on fatigue-related accidents are considered to be conservative. According to the National Highway Traffic Safety Administration, at least 100,000 police reported crashes are caused by tired drivers each year. However, the criteria for reporting drowsy driving wrecks are inconsistent among the states and two states—including Wisconsin—do not have specific codes for reporting drivers who are tired or who fall asleep at the wheel. Drive too close to other vehicles. Fail to stop in time to prevent a crash. Lose focus and abruptly need to make a turn or exit a highway. And these drivers may fail to see a rider at all or fail to accurately judge the rider’s distance from their vehicles. Accordingly, the unpredictably of a tired driver, the delayed reflexes of a tired driver, and the lack of awareness of a tired driver can result in serious motorcycle accidents. Riders who involved in accidents with tired drivers can suffer serious or fatal injuries depending on the unique circumstances of the crash. If you have been hurt—or if your loved one has been killed—by a tired driver, then you need to take action. Contact an experienced motorcycle accident attorney to discuss the cause of your crash and your potential recovery. 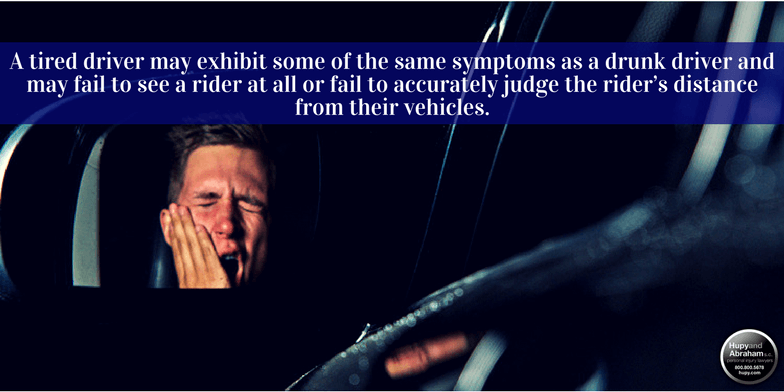 If you noticed the driver exhibit any signs of fatigue prior to or after the crash, then make sure that you report those to your attorney so that a full investigation can be done in to the cause of the accident. To learn more, please call us today at 1-800-800-5678 to schedule your free consultation.